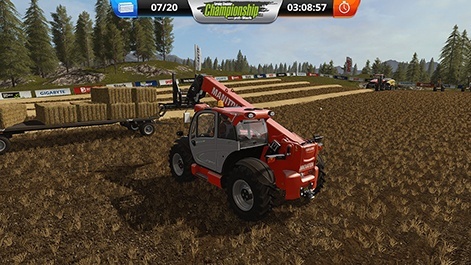 Last year, Farming Simulator firm Giants Software announced it was doing competitive tournaments for the sim title which, to be honest, is head-turning news. 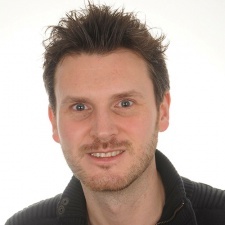 We caught up with PR and marketing man Martin Rabl to find out more. Tell me a bit about Giants’ interest in esports. We’ve just recently had our very first Farming Simulator Championship at the Agritechnica, the world’s largest convention for agricultural machinery. Agritechnica and the Landwirtschaftsverlag approached us with the idea and we really liked it. A lot of our players visit the convention anyway and it’s something different than just having a booth showing your game. The community is actively involved in it and knowing that some of the teams prepared dozens of hours for it is a sign for us that they were looking forward to an event like this, too. We definitely want to organise more tournaments, maybe with a variety of 'discplines‘. The event at Agritechnica drew a lot of spectators even though the booth wasn’t that easy to find. It’s also great for community building as many of them stayed for several hours watching and discussing the efforts of the players on the big screen. Why is pro-gaming something you want to be involved in? To be clear, for us it’s more a community thing than anything I’d call pro-gaming. It’s a challenge and entertainment for the viewers. Even though the winners of the tournament at Agritechnica received great hardware prizes it’s supposed to be a fun event to take part in. However, we think that it’s also a way for the community to show and experience that with solid tactics and skill you can win against your opponents - even if it’s in a farming discipline. What’s your experience of being in this space been like so far? The hardest part was figuring out how the booth should look like and how we want the overall experience to be like. On one hand, it shouldn’t look cheap but then, on the other hand, we thought that we should not go over the top either. Simply because it would not be too credible either. Farming Simulator does not have any competition elements built into the game itself. So while we made references to the esports scene, for example, we’ve designed jerseys that looked like esports jerseys, we hired a moderator and had a huge screen controlled with a video switching tool, we wanted it to be clear for all participants and viewers that it’s a serious competition but you’re here for the fun. We’ve learnt some lessons regarding how to hook up the gaming PCs with the video switcher and the big screen. It would have definitely helped to have the whole setup at the office before and test it out before we went there. But then again it’s not so normal to have a big LED wall at your office. Setting up the event is important and it goes beyond programming a video game. We’ve dipped our toes in there for now but we’ll see how we do it next time. There is a concern that esports is a bubble – a lot of companies are pumping money into the sector but, that I can see, few are making that investment back. Is this a concern for you? It’s not really a concern for us. Not at this stage. 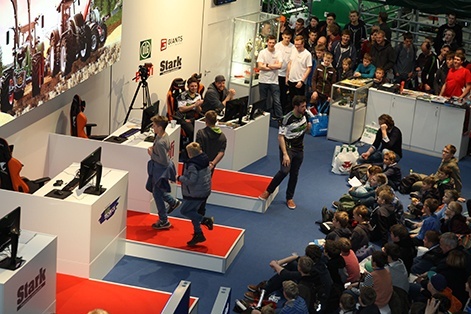 Like I’ve said we consider it more like esports-like tournaments and an addition to the game, a community event for the players and entertainment for the viewers like visitors of Agritechnica. However, maybe you could say that some of that thinking is already in there. I mean, we don’t rush into it now, change the whole game to be competitive and promise everyone that big money is waiting for them. What challenges have you encountered entering this space? Well, first of all in our case Farming Simulator doesn't have any competition mode in the game itself, so we needed to come up with a way to let players play against each other. At first, we thought that harvesting forage would be cool because you definitely need a team for it. You would have had one player in a corn harvester and several others unloading it with tractors and trailers. Whichever team produces the most after a certain amount of time wins. On a second thought, stacking bales sounded more exciting to watch for spectators coming to our booth. There’s a lot that can go wrong if you’re not careful and one person in your team can ruin the whole effort by pushing over a couple of bales when you’re just about to load the final one. This actually happened a few times during the tournament and once we saw the crowd react we know that it was a good choice. Technically we solved it by creating a mod for the game which is basically a special map with the needed vehicles and a loading wagon which keeps track how many bales are already on it. The other challenge was how to present it to the audience. We don’t have a lot of experience there yet but we definitely wanted to show more than just one camera view on the big screen all the time. I’d say it was a good choice to get a decent video switcher with preview outputs of all the player screens and the flying overhead camera for our quickly appointed ‚video editors‘ who learned quickly how to use the tool. What’s your ambition for this space? It would be great if we could establish a series of Farming Simulator Championship events but at the same time we think it’s a good idea to keep our feet on the ground. We will keep an eye out for events our community is likely to attend anyway so that we can piggyback there. We’d love to see that some of them form steady teams which other fans recognise and ideally support after a while. However, we’re not thinking „pro gamers“ here. But think of it in this way: There are times when we are at events and even though we might have new content or even a new game to show, the actual playtime for everyone is limited and stage show can get repetitive, too. So embedding a tournament there instantly tells a story which people can follow or even be a part of. Strengthening community interactions with entertaining content is what drives us.